Today marks the 40th Anniversary of Sesame Street, which premiered on November 10, 1969, and I can still remember watching the very first broadcast. I was in kindergarten, when the teacher alerted the class to a new show that was coming onto PBS. Mrs. McKlintock didn’t actually use the term, “PBS”—most of us five-year-olds would have thought she meant PB&J—or “Public Broadcasting System,” which would have sounded like something out of a 50s sci-fi flick, shown on the Saturday afternoon Creature Double Feature after the cartoons. She merely said Channel 2—Boston’s PBS station—which my classmates and I recognized as the go-to place for Mr. Rogers. Mrs. McKlintock coupled the announcement with the presentation of a promotional poster advertising the new show. 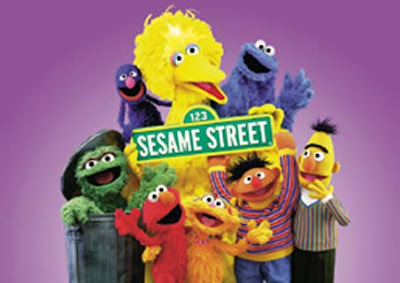 It featured shots of the various characters and cartoon shorts that would be part and parcel of Sesame Street. Oddly, though I distinctly remember Mrs. McKlintock’s endorsing the show and her display of the poster and subsequently tacking it up on the classroom wall, the only image that remains in my mind from the promotional piece is that of Wanda the Witch, a cartoon short that explained the letter W.
Even as a young’un, I thought it peculiar that an instructor would be hyping a television show, albeit an educational one, but such were the expectations and excitement from the teaching community for this “new” form of children’s programming. Up to that point, kids’ shows featured a central grown-up figure, in character, who would speak softly and sagely to his audience, and interact with other, usually more colorful, characters in human or puppet form. 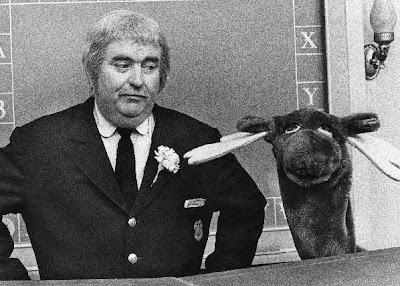 There were animated segments—the Bozo the Clown Show featured eponymous cartoons, while Captain Kangaroo ran Tom Terrific ones—storytelling, how-tos, animal discussions and the like. I was a keen fan of Messieurs Rogers, Bozo and Kangaroo, the latter being my favorite. Sesame Street retained these aspects, but tweaked them and revved up the volume. The action took place in a neighborhood, not a particular house or, in the case of Bozo, circus tent. 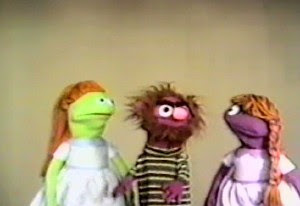 Instead of a central host, the show employed a team of human regulars—Gordon, Susan, Mr. Hooper, Bob, et al., interacting with muppets. Episodes were themed around one or more letters of the alphabet and certain numerals. Most importantly it offered ethnic and racial diversity, children with disabilities, and respected all equally. The in-your-face, staccato nature of segment-jumping and information presentation is de riguer today, but forty years ago was groundbreaking. I, like every other child, loved it, the sense that I never knew what was going to happen next, the diversity, the muppets, the music—Sesame Street utilized music videos long before such a form existed, influencing everything from Schoolhouse Rock to MTV. Some argue the show contributed to the emergence of Attention Deficit Syndrome, but I and many of my generation turned out—Oh, look, a squirrel! 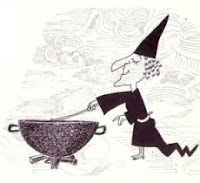 5: “Wanda the Witch”—if for no other reason than its indelible mark on my memory of the show from the poster in Mrs. McKlintock’s class (see pic above). 4: “What’s that Part”—Even as a child, I loved game shows, What’s My Line being a particular favorite that I would watch everyday with my grandmother. 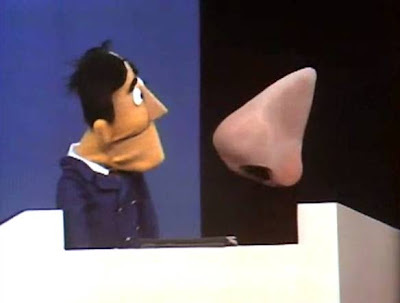 This muppet skit lovingly spoofed the show, having blind-folded muppet contestants try to guess the mystery-guest body part that was introduced by host Guy Smiley, a hilarious parody of game-show hosts, who still elicits a smile from me just thinking of him. 3: Joe Raposo—Okay, not a moment, but the shows music writer, whose contribution to the shows identity and the music world cannot be over-stressed. To pick a particular favorite would be impossible. 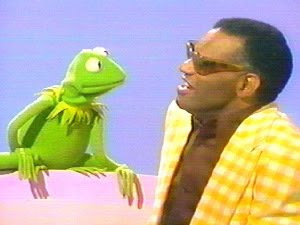 The man was a composing machine, writing such incredible songs as Kermit the Frog’s signature “Being Green”—which was recorded by such singing luminaries as Ray Charles and Frank Sinatra, “Sing”—The Carpenters cover of which became a hit in 1973—“Rubber Duckie” and the Sesame Street theme. 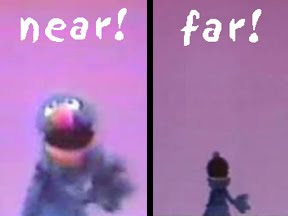 2: “Near and Far”—This segment alone solidified Grover as my favorite muppet. It is nothing more than the blue-furred innocent’s explaining the difference between “near” and “far,” drawing closer to the audience with the former and running to the background for the latter, over and over, as he exhausts himself to collapse. Still cracks me up. 1: “Mah Nà Mah Nà”—Presented in the show’s first season, this musical number has had several iterations since, but the original is still the best. The muppet equivalent of Joe Cocker begins this nonsense song by Italian composer Piero Umiliani, singing the title’s refrain, backed up by two “little-girl” muppets following with the song’s “bah dee, bah dee bee.” The verse repeats until the Joe Cocker muppet gets carried away on his own bridge, which escalates until he notices his back-up duo regarding him strangely. He slows to a pause, embarrassed by his free-flowing musical excursion along the “road not taken,” then looks at the camera and begins anew…. “Mah Nà Mah Nà…” Genius! Ahh, Sesame Street. I watched that all the time at the babysitters. Which was always followed by "Electric Company" I actually liked that more. Due in part to, you guessed it, Spider-Man being on there!